Confidence in golf begins on the practice range. Confident golfers tend to shoot lower scores. Confidence allows a golfer to be decisive in his club selection. He doesn't wonder if he has chosen the right club for a given shot. He knows he has. This, in turn, has a positive effect on the execution of the shot. A confident golfer has a plan in mind for each shot. He doesn't just swing and hope. Practice builds confidence. Knowing you have a repeating swing that can come through for you under pressure is the foundation of building confidence. 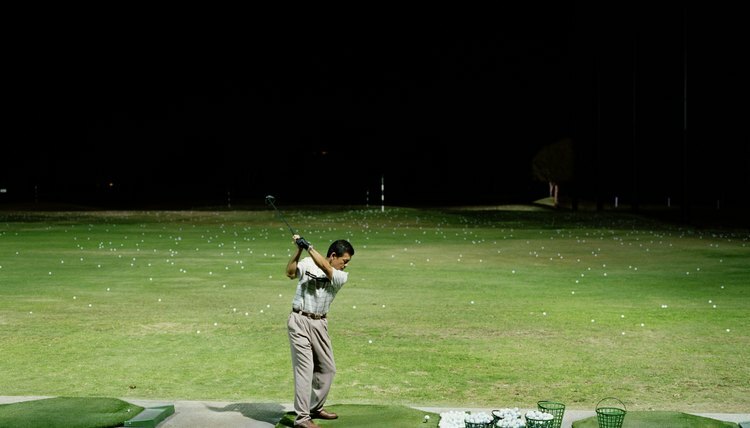 Spend more time on the driving range and hit each practice shot as though you are on an actual course and the stroke counts. When you tee off, your muscles will remember the successful shots you hit while practicing. In his book "Win and Win Again!" PGA professional and two time U.S. Open winner Curtis Strange refers to this as building "movement memory." Learn how to visualize success. Take PGA legend Jack Nicklaus' sound advice to "go to the movies" before you swing. He imagines the successful result -- the ball ending up where he intended. In his mind, he sees the ball in flight toward the target after taking the precise swing he needs to create that result. Work on controlling your nerves. Letting your nerves take over is a self-fulfilling prophesy for bad golf. You are afraid you will fail, so you rush your shot to get it over with and end up jerking the club on the takeaway or not making a full backswing. Slow everything down before you play a golf shot. Walk up to the ball more slowly. Take leisurely practice swings. Take deep, slow breaths as you select your club and address the ball. Remember the good shots; forget the poor ones. If you hit a super drive on one hole, commit that swing to memory and you'll be more likely to repeat it. If you lose focus on a hole and make a poor swing, don't get rattled. Just commit yourself to concentrating better on the next one. Compete against yourself, not everyone else. A golfer builds confidence by recognizing the improvement he's making in his game, not comparing himself to better players. If your average score continues to go down, mentally reward yourself. You'll be eager to get out to the course and continue your progress -- and you'll be more confident. Develop swing keys to stay on track. When you are playing well, you probably will have elements of your swing you are emphasizing. These are sometimes called swing keys. For example, a swing key could be remembering to make a full shoulder turn going back. Write your swing keys in a notebook. When your confidence starts to wane, refer to the keys and your swing confidence will be restored.